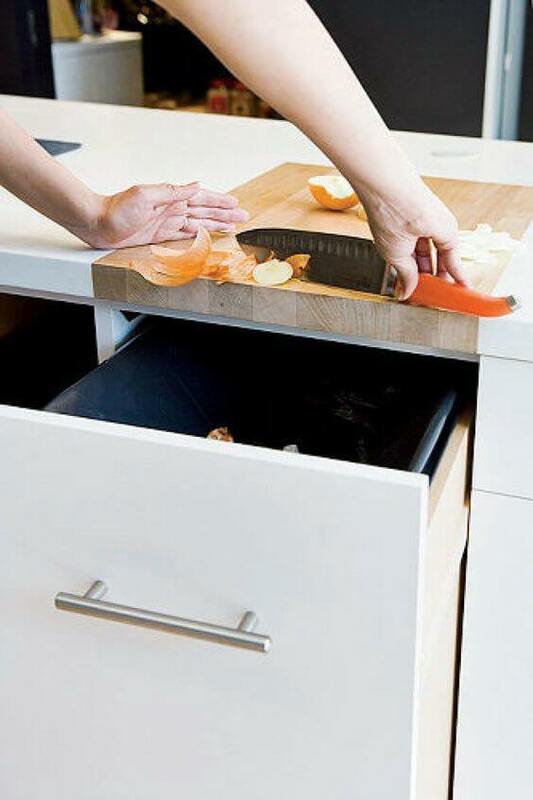 What's the practical addition to your kitchen? There’s a lot of work done in the kitchen. Unfortunately, when designing this space, people prioritise aesthetics more than the functionality and ergonomics. Let’s change that! Here are seven practical kitchen features that you should keep in mind when planning your kitchen. Follow these tips and working in your kitchen will be bliss! Breakfast bars separate the kitchen smoothly from another area in an open plan layout. When planning yours, don’t forget to include an overhang on your island. Waterfall designs are more comfortable for the people who will sit on the stools. Allow 12-19 inches (305-483 millimetres) of overhang for their legroom. Washing the dishes is easier with this hack. When you place the dishwasher near the sink, you avoid dripping food and grease on the floor. You don’t have to travel from one point to another while carrying a bunch of plates. You save yourself from mopping the grease off the floor too! Placing the dishwasher by the sink also allows you to connect the dishwasher plumbing to the drain and taps. When the dishwasher is next to the storage cabinet, stowing away the clean dishes are faster and easier. We recommend storing the plates, glasses, eating utensils etc on the side cabinets instead of the upper cupboards so you avoid straining your spine and back muscles. 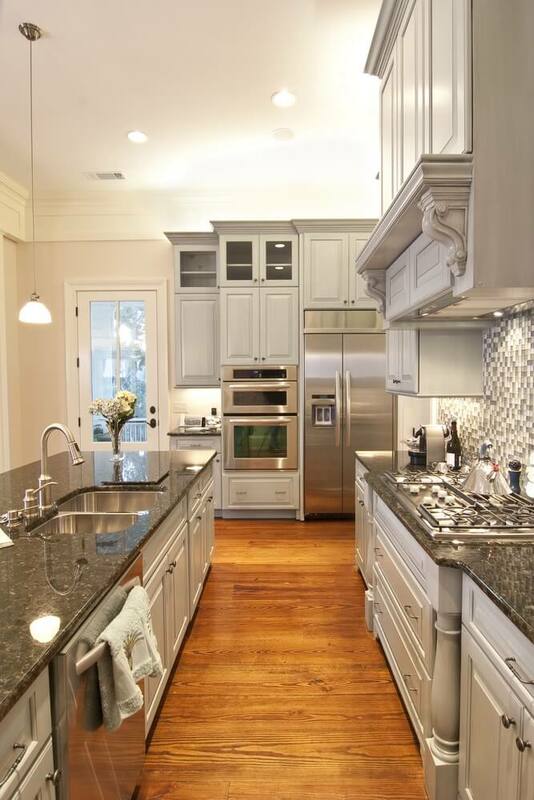 Contemporary kitchen with shiny granite countertops and elegant cabinetry. If your sink is located on the kitchen island, then it makes sense to put the dishwasher in a cabinet closest to it. One does not always prioritise the location of the bin when designing their kitchen. That’s too bad because trash collection is one of the things we should thoroughly plan in our kitchen. Your trash bin is not just for throwing food scraps and packaging away, it’s also for disposing of the rubbish you collected around the house. It’s best if you place it in the most accessible point of the kitchen, perhaps in the end of your island at the entrance of your kitchen. Superdraft tip: If you’re planning to have a compost bin, consider putting it close to your food preparation area. Streamlined kitchen designs are popular nowadays. 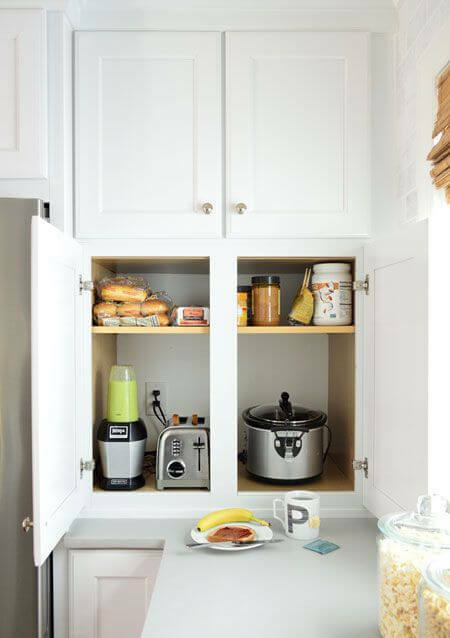 Homeowners fancy hiding their appliances in their cupboards. If you don’t want to move your machines such as coffee makers, microwaves, toasters, and electric kettles in and out of the cupboards, consider having sockets inside your cupboards. The kitchen is the busiest part of the house, which is why good lighting here is essential. We recommend that you layer your sources of light. Make sure your downlighting or the general lighting illuminates the entire kitchen. 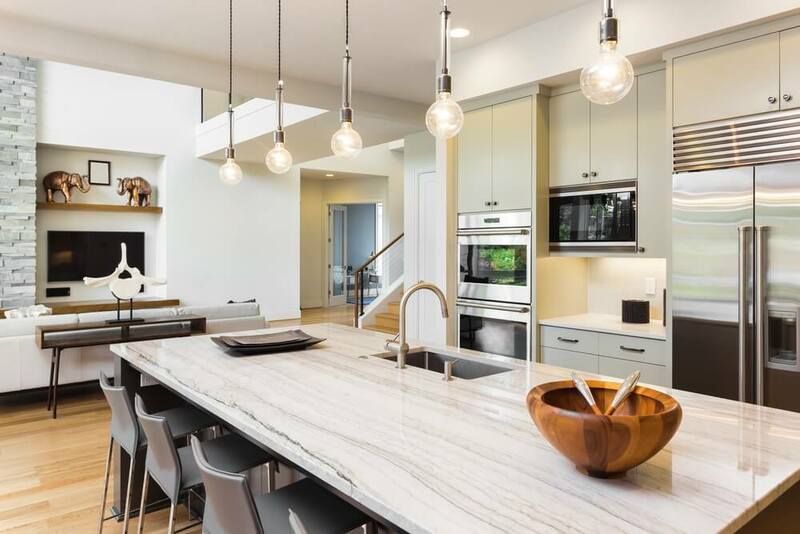 Hang pendant lights above your dining table and kitchen island so you have a dedicated light to these areas. Finally, install LED striplights or under-cabinet lighting to brighten your counters and the dark corners of your kitchen. Superdraft Tip: Be careful in positioning your task lights, particularly your pendant and under-cabinet lighting. Hang or install them directly over the food preparation area so it doesn’t cast a shadow over your workspace. Nobody wants a cramped kitchen. Allow 36-48 inches (915-1220 millimetres) of floor space in between two counters. This distance is enough for you to comfortably move in the kitchen while some doors (cupboards and dishwashers) and drawers are open. 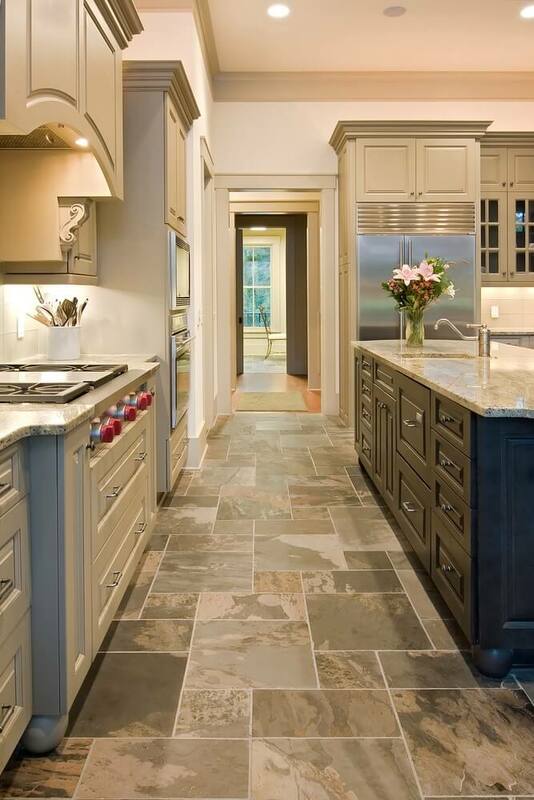 Expensive kitchen with slate floor tiles and custom mixed wood cabinetry.